It’s not just any T-shirt Quilt! 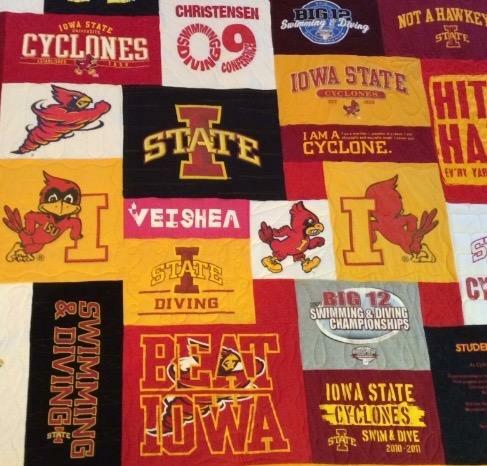 Minnesota T-Shirt Quilts is dedicated to making quality, one-of-a-kind heirloom t-shirt quilts. The most important thing to us is that you are 100% satisfied with your quilt! What makes our quilts different is the unique design, the special items you can add to your quilt, the custom quilting and the high quality fabrication and construction and care we put into your quilt. Each quilt block is cut into sizes that appropriately “frame” the logo on your shirt. We do not cut off portions of the logo, which happens if you choose a quilt maker who cuts all the blocks the same size. You can use more than just your favorite t-shirts in your quilt! As long as the item is washable we are happy to try and incorporate it into your quilt. 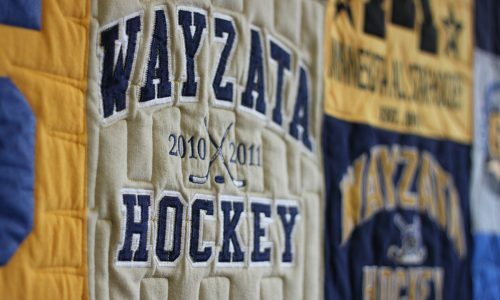 Sweat shirts, sport jerseys, hats, patches can all be used in your quilt. Your quilt is free-hand machine quilted on a professional grade, long arm quilting machine. Each quilt block will have its own unique custom stitched design and /or outline making the back look as remarkable as the front! Our quilts stand out from competitors because of our careful attention to details like this. Some t-shirt quilt makers use the same all over fill-in design, which requires less time and attention to detail. We never “tie” our t-shirt quilts, like some quilt makers do, because this with not secure your fabrics appropriately and may significantly reduce how long your quilt will last. Our free-hand machine quilting is optimal for both design and durability. We make sure to use high quality fabric and supplies to assure you have a long lasting t-shirt quilt to pass on for generations. There are 3 main fabric components to create your t-shirt quilt. First, we create the “quilt top” using the shirts and clothing items you provide to us. Second, we insert the middle layer called the “batting.” This is the insulating material to give you warmth when you use your quilt. We use Legacy 80/20 (80% cotton, 20% polyester), a soft and durable batting that is machine wash-able and allows for good quilt stitch definitions. It is made of 80% cotton and 20% polyester. Lastly, we complete the quilt with a backside fabric called “backing.” We use 100% Robert Kaufman Kona cotton backing fabric in a solid color of your choosing. Using the solid color fabric allows you to see the custom quilted stitching that makes the back look as good as the front. Using good quilt products is essential to making your t-shirt quilt durable and everlasting. The quilt is awesome! Thank you for the attention to detail and the excellent workmanship. Everyone is amazed. The quilt will be a keepsake in my family for decades. Ultimately, using quality products is essential in making your special quilt durable and everlasting. Our goal is to create quilts you can really use-we don’t want your t-shirt quilt kept in a drawer. We create functional, washable, high quality quilts that will be used and cherished for years! To say that they are beautiful is an understatement. The quilting is so much more than what I could possibly have envisioned. I am so anxious to give them to my grandchildren. Again, thank you so much for your work on making these quilts a true memory keepsake for our family. I know that this is your "job" but it is obvious that it is so much more for you. I think every time I look at them, I see something new.